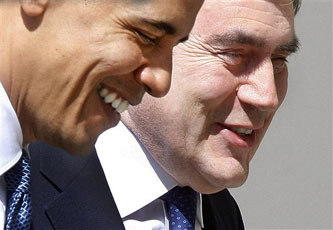 Obama has been briefed about the British press corps and sees no reason to humour them. This would not be wholly unsurprising: Fleet Street’s finest are viewed as scatalogically-obsessed, bottle-throwing, teenage yobs far too fond of relieving themselves behind the bushes in the Rose Garden, or worse, in the East Room’s pot plants. I think his motives are actually a bit colder. Obama’s most powerful diplomatic weapon right now is his own international popularity, and he seems to be making it clear that he won’t share it with just anybody. Obama giving the cold shoulder to Brown probably doesn’t mean he has any less respect for the special relationship with Britain than any of his predecessors. More likely, and bluntly, he probably just thinks of Gordon Brown as a bit of a loser. Why roll out the red carpet for guys like Brown and Taro Aso who will likely be out of office soon anyway? Something tells me that when Dmitry Medvedev or Hu Jintao visit the White House, the Obamas will break out the good china. Poor Gordon. He’s the Herbert Hoover of British prime ministers: a guy who took over at precisely the wrong moment and hasn’t been able to figure out since how to deal with the hand he’s been dealt. He probably never had a chance.